#NotInMyName protest in posh Ahmedabad area amidst chants of "Zinda hai to halla bol", "Le ke rahenge azadi"
Ten days after “Not in my name” protests commenced in top Indian cities of India, Ahmedabad’s posh Satellite area saw a few hundred people – mostly activists and intellectuals – come together on Saturday to "demonstrate in solidarity" against frequent incidents of lynching across the country. Held between 3 and 6 pm after the Gujarat police “allowed” the demonstration a day earlier, those who participated amidst chants of “Zinda hai to halla bol” and “Le ke rahenge azadi” by a young radical group included veteran High Court advocate Girish Patel, former BJP chief minister Suresh Mehta, senior sociologist Ghanshyam Shah, ex-National Institute of Design director Ashok Chatterjee, top Dalit rights activist Martin Macwan, among others. While on June 28, “Not in my name” protests were held in Delhi, Bengaluru, Lucknow, Patna, Hyderabad, Kolkata, Jaipur, Gaya, Faridabad, Mumbai, Allahabad and other locations, these were followed by protests in Pune on June 29, and Chennai on July 1. 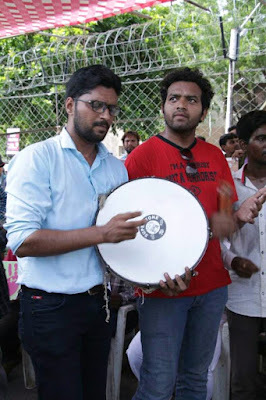 Ahmedabad protests were held amidst news coming in from Delhi that a mob assaulted six men who were transporting buffaloes to a slaughter house in east Delhi. One of the victims sustained serious injuries while the remaining five were released after receiving medical aid. The police arrived at the scene after the attackers escaped. In their complaint, the victims said they were transporting around 80 buffaloes in mini-trucks when the mob stopped them near Baba Haridas Nagar. The mob beat the six men inside the trucks after releasing the cattle. The transporters claim to have had the required documents to ferry the animals. Protesters in Ahmedabad complained, the BJP has been encouraging cow-related violence. 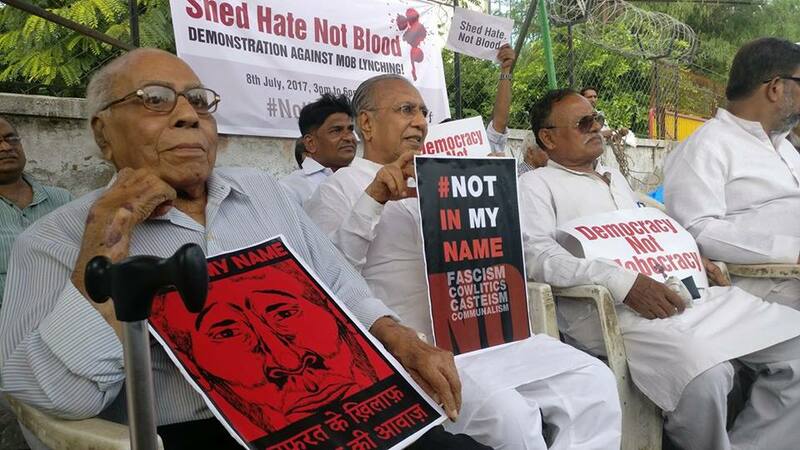 Citizens across the country staged protests against the lynchings and targeted violence, and Prime Minister Narendra Modi’s insistence that the “killings in the name of cow worship is not acceptable. 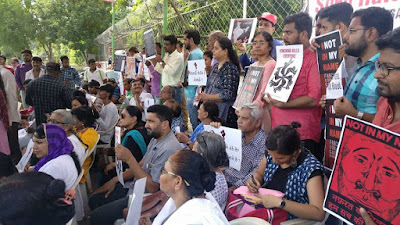 The view was strong, the simmering anger against the incidents of violence against Muslims and Dalits boiled over across India, when a Facebook post from a filmmaker about Junaid Khan’s “unseen” public lynching became a rallying point for a spontaneous citizens’ protest that spread across cities in India on June 28. The police permission to hold the protest, which was received on Friday afternoon, interestingly, did not allow any loudspeaker to be used by speakers. The permission was sought by Gujarat Jan Andolan, an apex body of human rights organizations of the state. 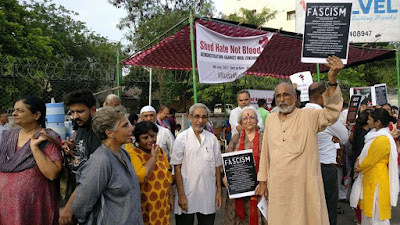 The biggest protest in India was held on July 3, when thousands walked from Kotwal Udyan to Chaityabhoomi in Dadar West, with many citizens, organisations, and Dalit and left political parties coming together under one banner of “Nafrat Ke Khilaf, Insaniyat Ki Awaaz.” The march began and ended with poetry recitation and songs. One saw leaders like Prakash Ambedkar, artists like Dan Husain and writers like Rahman Abbas and Dorab Farooqui. 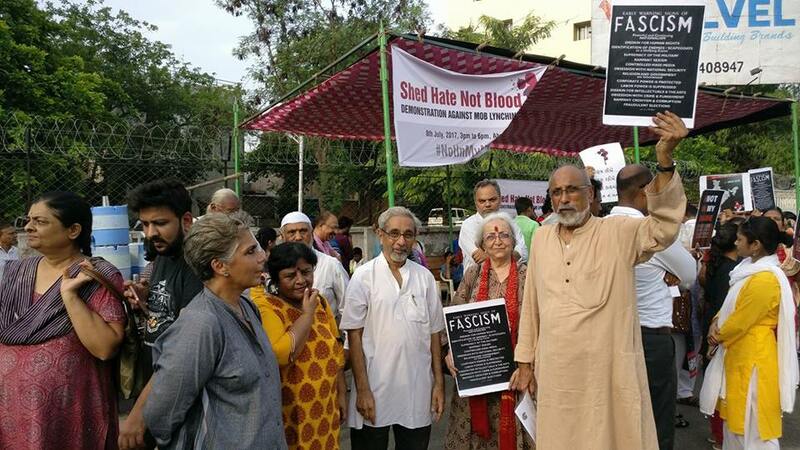 Film-maker and activist Anand Patwardhan, film-maker Dibakar Banerji, photographer Chirodeep Chawdhary, feminist activists Hasina Khan, Chayanika Shah and Nandita Shah were also present, actor Shabana Azmi, among others.